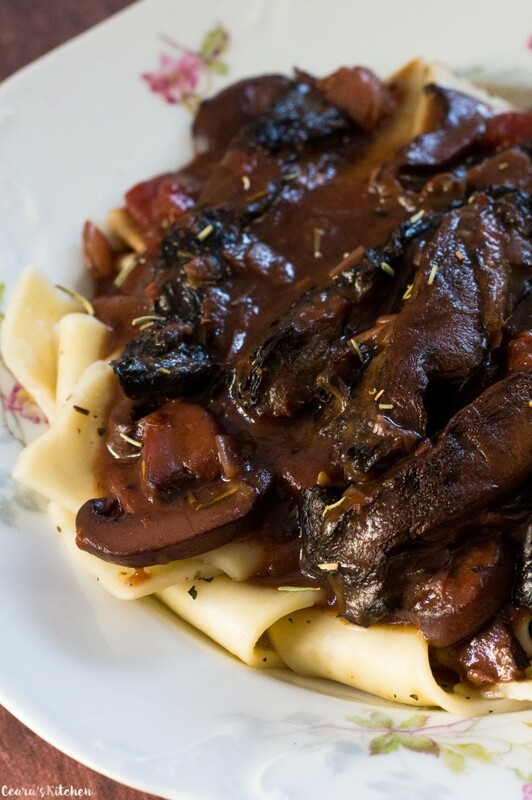 Vegan Beef Bourguignon made with a hearty, meaty and incredibly flavorful mushroom and red wine reduction sauce. A simple and traditional French recipe that uses a handful of ingredients and gets its rich and deep flavours from simmering on the stove for at least two hours on a very low heat. The majority of the cooking time is “hands-off” but the longer cooking time makes this one of my favorite meals to make on the weekend. Is Beef Bourguignon a traditional meal made in your family!? My background is French Canadian and Beef Bourguignon is definitively a staple meal at family dinners. My Mamère (great-grandma) and her sister-in-law, my great-great Aunt Pierette, were both known for their Beef Bourguignon. It was always served at family meals and is a huge tradition in our family. I learned to make Beef Bourguignon from my grandma with a recipe that was passed down for generations. Eating it always brought back visiting my family up north and spending time with family. As you guys can imagine, it’s a meal I’ve been meaning to veganize and remake for ages! My stepmom and I were experimenting in the kitchen yesterday and put our minds together to make Vegan Beef Bourguignon that is JUST as meaty and maybe (dare I say it!) MORE flavorful than the traditional recipe! The meaty texture and flavours in this Vegan Beef Bourguignon comes from using both cremini AND portobello mushrooms. 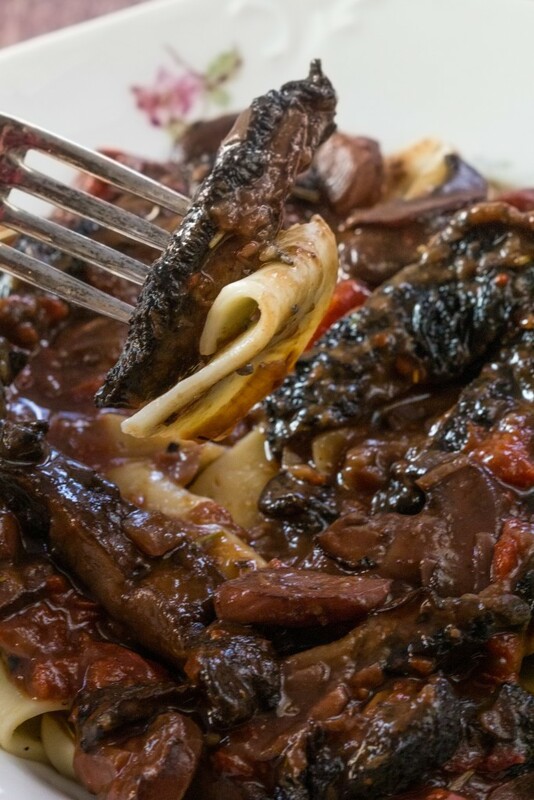 The cremini mushrooms simmer are added at the beginning and simmer in the sauce for hours until they are sooo incredibly tender they basically fall apart in your mouth. The portobello mushrooms are tossed in flour and roasted until slightly crispy. They are added in during the final half hour of cooking time. Adding the portobellos at the end makes them keep their “steak-like” texture and consistency. I mean look at that slice of mushroom steak! 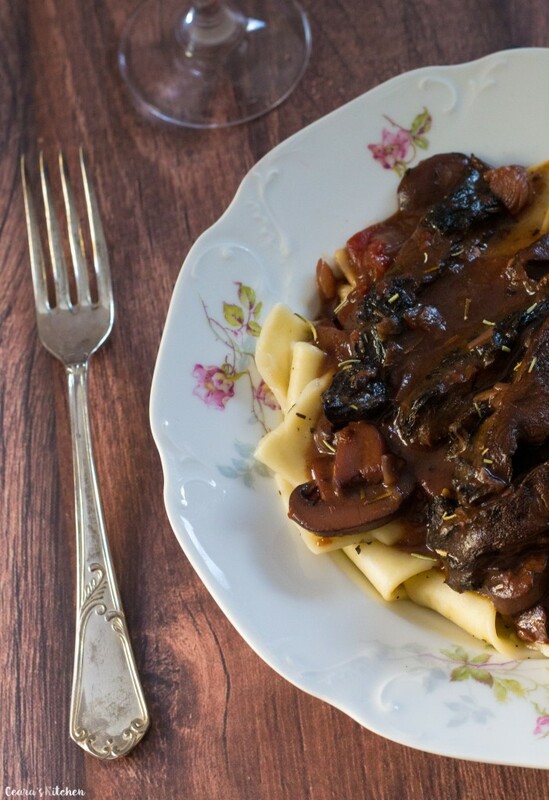 If you whip this Vegan Beef Bourguignon up at home, I love hearing your feedback! Leave a comment below or snap a shot and tag me #CearasKitchen on Instagram! 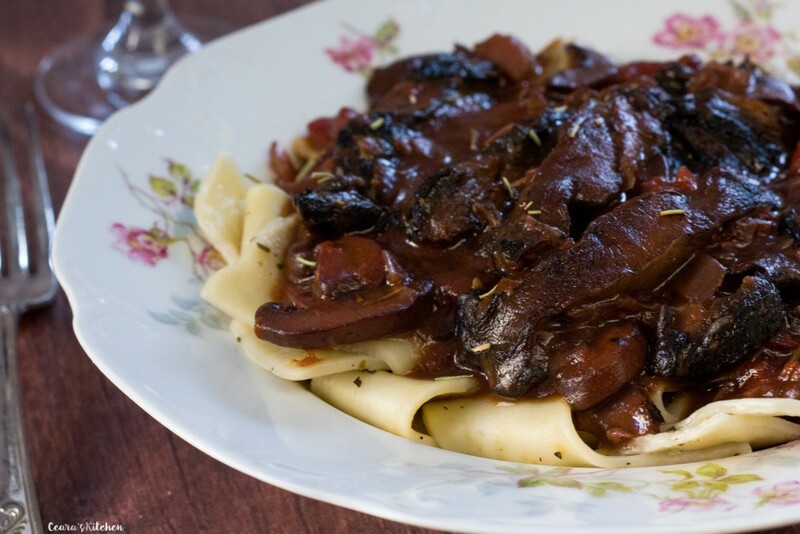 Vegan Beef Bourguignon made with a hearty, meaty and incredibly flavorful mushroom and red wine reduction sauce. A simple and traditional French recipe that uses a handful of ingredients and gets its rich and deep flavours from simmering on the stove on a very low heat. The meaty texture and flavours in this Vegan Beef Bourguinion comes from using both cremini and portobello mushrooms. Over medium-high heat, in a large cast iron pot (dutch oven), sauté onions and garlic with a couple splashes of water (or oil) until translucent. Add the spices (rosemary, thyme, dry mustard, white pepper and sea salt) to the pot, continuing to sauté the onions for a few minutes until the spices are fragrant. Add the cremini mushrooms and sauté with the onion and spices for five minutes. Add the red wine, chopped tomatoes and bay leaves. Cover and bring to a light boil. Turn down the heat to low and leave to simmer on the stove for 2 -3 hours, stirring every half an hour or so. Pre-heat the oven to 400F/205C. In the final hour of cooking, remove the bottom of the portobello mushrooms and slice in thick “steak-like” strips. In a large ziploc bag, toss the portobello mushrooms in 3 tbsp of flour. Place the mushrooms on a lined pan and sprinkle with salt and pepper. Roast for 15-20 minutes in the oven until slightly crispy. While the mushrooms are roasting in the oven, carefully scoop out 1 cup of the stew and add to a medium size bowl. Add the remaining 3 1/2 tbsp of flour to the bowl with the stew. Whisk together the flour and stew together until completely smooth. Add the flour-stew mixture back into the pot while whisking rapidly. Add the roasted portabello mushrooms to the pot. Simmer the Vegan Beef Bourguignon for the final half hour. 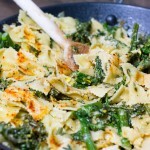 Serve over [url href=”https://www.cearaskitchen.com/egg-free-homemade-pasta-vegan/” target=”_blank”]pasta[/url], potatoes or rice. I love serving this with my [url href=”https://www.cearaskitchen.com/easy-whole-wheat-artisan-bread-no-knead/” target=”_blank”]Crusty Easy Artisanal Bread[/url]. 1) Make sure your red wine is vegan. I love to make this recipe with Cabernet Sauvignon or Burgundy wine. [br]2) To make this recipe gluten free, replace flour with 3 1/2 tablespoons of certified gluten free corn starch. Toss the portobello mushrooms in 1 tbsp of corn starch and whisk the remaining 2 1/2 tablespoons of corn starch with a 1/4 cup of cold water until a smooth. Whisk the corn starch and water mixture into the pot. [br]3) I love serving this recipe over my [url href=”https://www.cearaskitchen.com/egg-free-homemade-pasta-vegan/” target=”_blank”]Egg Free Homemade Pasta[/url]. I played a bit with the recipe, partially to downsize, 1 vegan in the house and 8 meatitarians. The others ate a Julia Child version with beef. Most tried the vegan version and liked it . I added carrots, did not use the canned tomatoes but used tomato paste and dehydrated tomatoes. I will need to work on the flour dredging of the mushrooms, think I over coated the mushrooms, but I liked the technique of roasting the portobellos. I used button rather than cremini mushrooms. Used 1 cup of Cabernet Sauvignon Merlot and 1 cup vegetable broth. Served on mashed potatoes. Most tried the vegan version and thought it was very good. Will definitely try again. Thanks for a good translation of a classic recipe. Mushrooms turned out really well. Sauce was, as others have said, not sweet enough. I think most recipes call for carrots and I think this would have been a good addition. Method is okay and texture was fine, but flavor wasn’t quite what I was looking for. While I have absolutely NO interest in ever being a vegan or vegetarian–tried it for a month in my 20’s and hated it–I can see that this recipe would be very good added to classic beef bourguignon, so that’s what I’m going to do with it. Same here, mine tasted like wine stew. um why ruin a VEGAN dish with chicken stock? or why bother trying to make it vegan at all? Great meal! Even the meat eaters loved it! Amazing! Happy it was a hit! Everyone loved it!! Even the meat eaters. I followed the recipe exactly. Do you have any idea how I could convert this to using my Instant Pot? Cooked today, smelled and sauce tasted great. I will finish the dish, cooking the portabella in flour in the oven for dinner later in the week. I cooked/reduced the sauce in the oven instead of on the stove top. I would like to make this dish and freeze it for a later date. Have you ever done that before, and if so I wondered if you’d freeze it after it’s done its first 2-3 hr simmer or at the end of the cooking? Any tip would be appreciated. Thank you. I had to come up with something for the wine reduction that would have a lot of flavor and the subtle sweetness of wine but without the alcohol. I searched online for wine reduction substitute and just about everything I read said to use vegetable broth. In my mind, that does not have enough flavor. I happened to have some beet juice and gave it a try. It was just what I was looking for, depth of flavor, subtle sweetness (I did use a little veggie broth), and rich color of a wine reduction. It has been awhile since I have done a real wine reduction so I wonder how close I came to the actual flavor of the bourguignon. I #’d you on my Instagram. Thank you for the recipe. 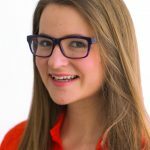 Everything I see on your site looks fabulous! Hi, as a fellow French Canadian I’m a huge fan of Beef Bourguinon sans the beef. I made this for Christmas Dinner and served over Vegan Mashers. It was a big hit. But going forward I am going to eliminate the can of tomatoes and substitute 1 Tbsp of tomato paste and more veggie broth as needed. It was too tomato flavored for my taste. This also eliminates the need to use more flour to thicken the stew. And I’ll add carrots next time as well. But all in all a great recipe and your work pulling it together is much appreciated. As far as the tomato flavor, I’m sure the flavor profile varies my region. I know the first time I tasted tortierre that wasn’t made by one of my relatives I was quite surprised by the difference. Why don’t you have Pintrest as a new option to save this? If you are going to make this the night before would you add the crisped Portobellos the night before or add them the day of the serving when you are warming the stew up? I would add them the day of. You can cut all the mushrooms the day before though. I’ve done this before to save time on the day of. Are you related to Pierrette & Lucilleanne & Hugh Montpetit from Thessalon? I went to school with them there, and have always wondered where they are. Would love to make this for a party. Can you make it the day before? Is there a way to use a slowcooker instead of a dutch oven? I have made this recipe in the slow cooker, however, I do find that the final steps with the portobello mushrooms and flour does work best in a dutch oven or deep pot on the stovetop (to get the sauce really “meaty” and thick). I’ve made this twice now, and it is so delicious – definitely in my rotation of favorite recipes! I did the recipe yesterday and I don’t know where it went wrong… the taste of the wine was awefully too much present, I had to make it cook over 5 hours (at Low simmer) before it could actually taste something else…. I’m sure it’s something I didn’t understand I’m not a really good cook haha. Hm… I am wondering if it was the wine you used? Wines have a huge variation in flavor and could potentially alter the results in the Bourguignon. The wine should be on the “dry” side to taste good in the sauce and the result should be “rich” tasting (but not too wine-y). I would try it with a dryer wine next time to get better results. Also, if you’re sensitive to the wine taste – sub broth 1 for 1! I changed to the vegan dietary lifestyle 1 1/2 years ago and have been searching for a hearty main course to pair with my oenophile friends fabulous aged wines. This recipe will now be my go to for fine dining events. Both vegans and non-vegans alike loved this recipe. I would like to add the following notes,,, Salt to taste prior to serving. The amount of flour was perfect. The consistency of the dish is perfect for serving either with pasta or fingerling yellow potatoes (I served it with both). Thank you for this recipe! You’ve given me a lovely dish that holds true to French cuisine! Did you take the gills out of the portobellos or leave them in before roasting? OK… can’t say I’ve seen cremini mushrooms in our local stores. What’s next best? Oyster/Shiitake? Oyster and shiitake would also be delicious. I’ve subbed the cremini mushrooms for white mushrooms in the past and the recipe worked out perfectly! Looks like this would make a great pie filling too, can’t wait to try it. Could this be done in a crock pot? Did you make your own noodle? I’ve been looking for extra wide noodle EVERYWHERE and can’t find it. Makes me sad as I used to be able to find it. this recipie would be far better without the flour, it makes it far too thick and gloopy, otherwise it’s not bad, I won’t use flour next time. Interesting – I am not sure why the flour made your’s gloopy. The consistency should be thick and stew-like, like in the photos. The flour thickens up the sauce as well as makes the portobello mushrooms crisp and firm for cooking. 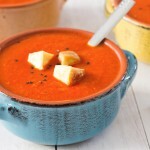 Did you mix the flour with 1 cup of the stew and whisk, removing any lumps before adding to the stew? I am bookmarking this for when I am back home this summer. I would love to make it now but we are on a boat and I can’t use 3 hours of propane. Can’t wait to try it, however. It looks amazing!!! thanks for sharing this with us. If you had to guess, about how many pkgs. is 8 cups of chopped mushrooms?